Debugging – we all do it a lot. Writing code perfectly the first time around is hard and only a few (if any) succeed at it. More than a year ago, Shameer wrote an article on SitePoint about how you can debug your application using Xdebug and Netbeans. In this article, we are going to have a look at how we can debug using Xdebug in combination with Sublime Text. First of all, we need to have the PHP Xdebug extension installed. If you are uncertain on how to get this done, please have a look at the link provided in the introduction. Make sure that Xdebug is working by checking if it’s listed in your phpinfo(). Of course we also need Sublime Text. I will be using the latest version: Sublime Text 3. It should also work with Sublime Text 2. We need to configure xdebug by adding the following to your php.ini file, or even better, to an xdebug.ini file as described here under How-to On Linux. In general you will be using 127.0.0.1 as your host. However, If you are using vagrant for example, you will be using something like 10.0.2.2, depending on where Xdebug can find your system. The remote log is not necessary, but in case of problems, it’s the place where you can find information about errors that occurred. One of the strengths of Sublime is the fact that you can extend it easily with packages. In this case, we are going to install the Xdebug package. If you haven’t done so already, make sure you can install packages by installing package control. 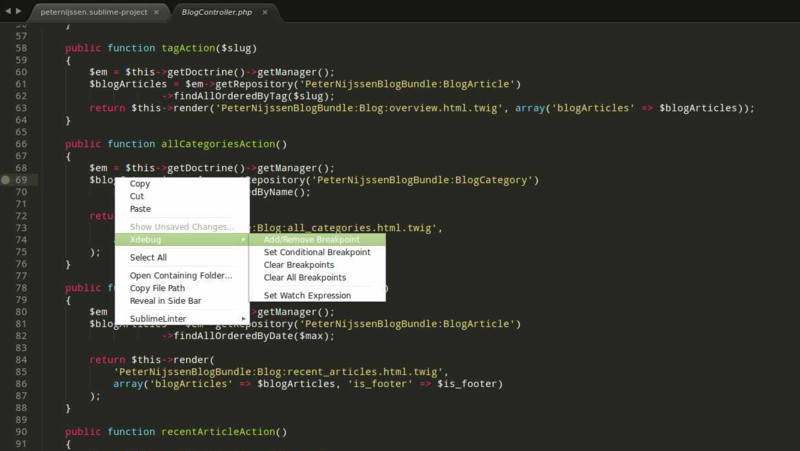 Once you have the package control installed, you should start Sublime Text 3. Open up the command palette from the tools menu and search for “install package”. Now you can search for any package you like. In our case, we are going to search for the package “Xdebug client”. The last bit we have to do is set up the project within Sublime. The easiest way to do this is to open up the root directory of your application, go to projects and click on “save projects as”. I suggest you save the file within the root of your application, so you can save it in your version control system if you are using any and you can configure it easily at all times. As you can see, I only added a URL to my actual web application. I could set more settings for Xdebug, however, this is enough to start with. I could have also set this URL in the Xdebug settings itself, but in that case, I couldn’t work on multiple projects without having to change the Xdebug config each time. We can now start the Xdebug session to see if everything is set up properly. In the menu, click on tools -> Xdebug and click on start debugging (launch browser). You will notice that your website is opened up and that ?XDEBUG_SESSION_START=sublime.xdebug is added to the end of the URL. This will start the xdebug session. 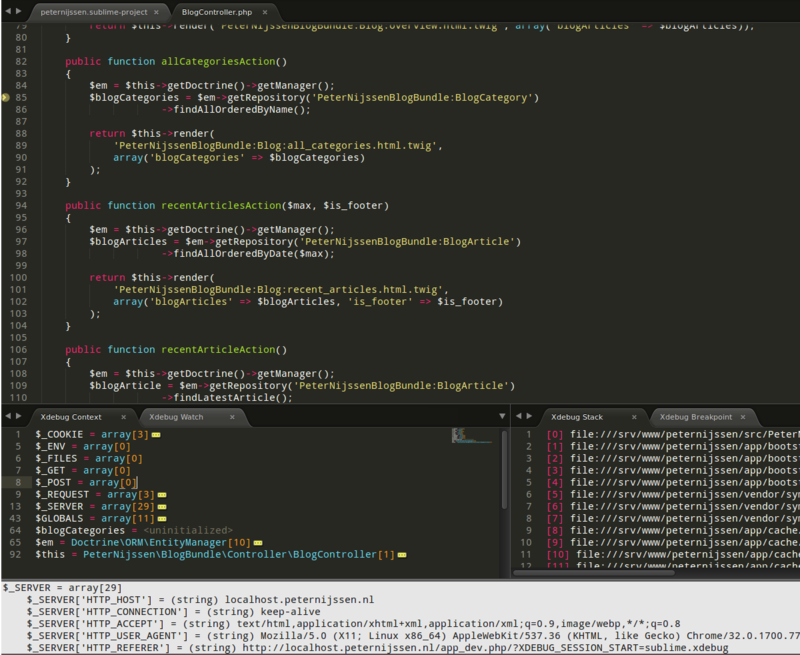 In Sublime, some extra panels appear where debug information will be shown, after you have set one or more breakpoints. Let’s set out first breakpoint. A breakpoint is basically a flag where your application will halt when it reaches it. At the moment it halts, you can inspect all the variables’ values so you know actually what is going on. We can add a breakpoint by clicking with our right mouse on a line, going to Xdebug and then clicking on add/remove breakpoint. A marker will be added to the line gutter to indicate that a breakpoint has been set. We open up our browser again and continue with the session we just started. You will notice that as soon as you go to the page where the breakpoint is, the page will stop loading. If you now open up Sublime, you will see a lot of information shown in the Xdebug panels. The Xdebug stack and Xdebug context are very interesting. In the stack, you can see the whole stacktrace your call went through. In the context, you will see all global variables, but also the variables you defined yourself. You can click on these variables to see exactly these variables are holding. For instance, in the screenshot below, I clicked on the $_SERVER variable. Notice that a yellow arrow is pointing at the line the application is currently halted on. Run Which will run the application until the next breakpoint or until the ending. Run to line which will run until the line you clicked. Step into will step into the current function and stops right after. Step over Will step over the current function and stops right after. Step out Will step out of the current function and stop right after. Detach Will also stop debugging. Run and stop are quite easy to understand. The step methods could be a little confusing. Let’s dive into these with a simple example. Imagine you added a breakpoint to the first line of the method bar. So on the line with the breakpoint comment (// breakpoint). With step into, the debugger will step into the fooBar method and will stop there at the first line. So in this case, the debugger will halt on the return array_values($arr); line. Lastly, with step out it will run through the whole bar method and return to the caller. In this case, it will go out of the object, back to the original caller. If you just decide to run, the application will run further until the moment it is done executing or another breakpoint occurs. In this article we saw how we could integrate Xdebug with Sublime and made sure we understood how to debug. Almost every IDE suitable for PHP can integrate with Xdebug. If you are interested in debugging like this in Netbeans, have a look at the article mentioned in the introduction. Are you using breakpoints? Or are you using PHP functions like var_dump to get your debug data? Let us know in the comments below!